Bumblebees are in danger in many countries because of the habitat and the destruction to nature's natural life habitat. 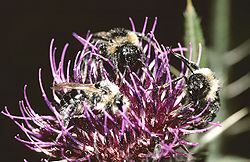 In Britain, 19 species of native bumblebees were discovered along with cuckoo bumblebees to have become extinct, eight are in serious decline, and only six remain widespread. A decrease in bumblebee population could cause drastic changes to the countryside, leading to inadequate pollination of certain plants. One misconception of bees is the assumption that the buzzing noises from a bumble bee is that of their beating wings. When actually the sound is the bee vibrating its flight muscles which are separated from the wings—a feature only known in bees. 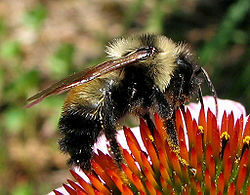 This is especially emphasized in bumblebees, as they warm up their bodies to get airborne and decrease in temperature. Bumblebees have been known to reach an internal temperature of 30 °C (86 °F) using this method. Cuckoo Bumblebee by Wikipedia, publisher, 18 June 2009. Bumblebees - the Genus Bombus by About.com, New York Times Comp. This page was last modified on 3 January 2010, at 17:08.